Comprehending the way things get done involves taking into consideration the human factor as a composite syntax of thoughts and actions. Studying individuals and groups of people in the process of accomplishing their core purposes, sheds light to the importance of “Inner Game” that refers to the internal thinking processes, the mindset. It is the key to successfully master the “Outer Game” which encompasses behaviors and actions in order to thrive, navigate and break through challenges. Towards that direction, as of 1998, Synolic® Development Systems has selectively incorporated and specializes in applying leading-edge scientific approaches in mindset education, to release resourcefulness and generativity in people’s ventures on multiple levels, to accelerate and increase the chances towards a more consistent success pathway. 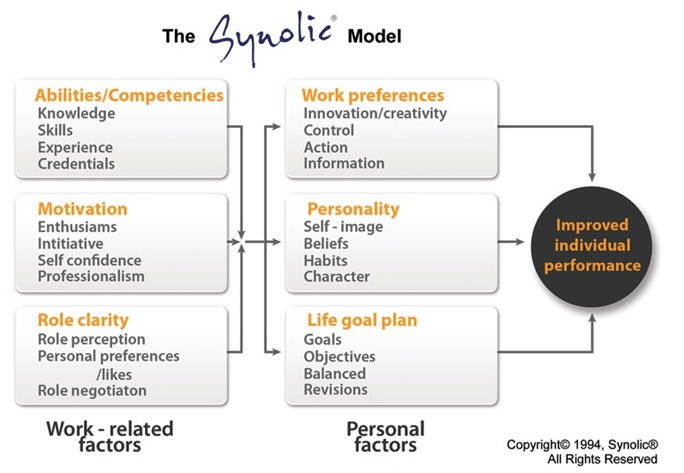 The Synolic® HRD model designed by Dr. Alan M. Barratt and Dr. Patrick Georges. It examines not only work related factors (abilities / competencies) but also personal factors (work preferences, personality, life goal plans) that influence people’s decisions and account for much of human behavior. -the British management journal Executive Development, 1995.